Freedom is the end at which the concept of the common good seems to culminate. It is believed that a person can express their thoughts in a free society in a constructive manner and make democracy strong. For us, education is a weapon that can free a person from the prison of ignorance. Last Saturday, when the School Leaving Certificate (SLC) results were published, a headline on a leading English daily read ‘Boys fare better than girls’, highlighting the male pass percentage of 49.43 against 38.27 for girls. This headline alone asserts that we continue to live in unequal societies where females are behind in every sector of society and education is no exception. But such headings, though bonafide, also serve to impress on the population an image of the female as les capable than males. 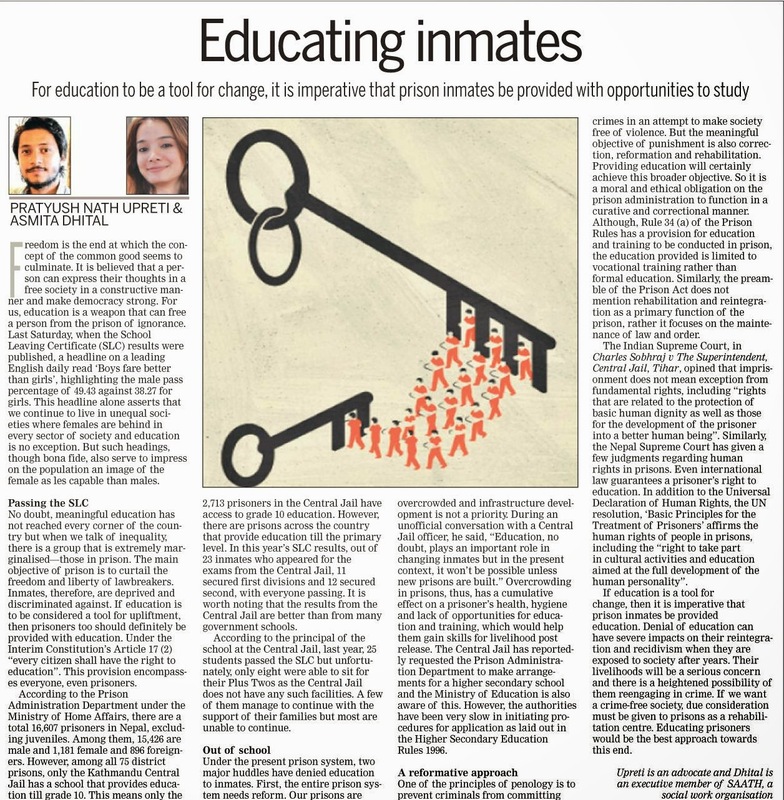 No doubt, meaningful education has not reached every corner of the country but when we talk of inequality, there is a group that is extremely marginalised—those in prison. The main objective of prison is to curtail the freedom and liberty of lawbreakers. Inmates, therefore, are deprived and discriminated against. If education is to be considered a tool for upliftment, then prisoners too should definitely be provided with education. Under the Interim Constitution’s Article 17 (2) “every citizen shall have the right to education”. This provision encompasses everyone, even prisoners. According to the Prison Administration Department under the Ministry of Home Affairs, there are a total 16,607 prisoners in Nepal, excluding juveniles. Among them, 15,426 are male and 1,181 female and 896 foreigners. However, among all 75 district prisons, only the Kathmandu Central Jail has a school that provides education till grade 10. This means only the 2,713 prisoners in the Central Jail have access to grade 10 education. However, there are prisons across the country that provide education till the primary level. In this year’s SLC results, out of 23 inmates who appeared for the exams from the Central Jail, 11 secured first divisions and 12 secured second, with everyone passing. It is worth noting that the results from the Central Jail are better than from many government schools. According to the principal of the school at the Central Jail, last year, 25 students passed the SLC but unfortunately, only eight were able to sit for their Plus Twos as the Central Jail does not have any such facilities. A few of them manage to continue with the support of their families but most are unable to continue. Under the present prison system, two major huddles have denied education to inmates. First, the entire prison system needs reform. Our prisons are overcrowded and infrastructure development is not a priority. During an unofficial conversation with a Central Jail officer, he said, “Education, no doubt, plays an important role in changing inmates but in the present context, it won’t be possible unless new prisons are built.” Overcrowding in prisons, thus, has a cumulative effect on a prisoner’s health, hygiene and lack of opportunities for education and training, which would help them gain skills for livelihood post release. The Central Jail has reportedly requested the Prison Administra-tion Department to make arrangements for a higher secondary school and the Ministry of Education is also aware of this. However, the authorities have been very slow in initiating procedures for application as laid out in the Higher Secondary Education Rules 1996. One of the principles of penology is to prevent criminals from committing crimes in an attempt to make society free of violence. But the meaningful objective of punishment is also correction, reformation and rehabilitation. Providing education will certainly achieve this broader objective. So it is a moral and ethical obligation on the prison administration to function in a curative and correctional manner. Although, Rule 34 (a) of the Prison Rules has a provision for education and training to be conducted in prison, the education provided is limited to vocational training rather than formal education. Similarly, the preamble of the Prison Act does not mention rehabilitation and reintegration as a primary function of the prison, rather it focuses on the maintenance of law and order. The Indian Supreme Court, in Charles Sobhraj v The Superintendent, Central Jail, Tihar, opined that imprisonment does not mean exception from fundamental rights, including “rights that are related to the protection of basic human dignity as well as those for the development of the prisoner into a better human being”. Similarly, the Nepal Supreme Court has given a few judgments regarding human rights in prisons. Even international law guarantees a prisoner’s right to education. In addition to the Universal Declaration of Human Rights, the UN resolution, ‘Basic Principles for the Treatment of Prisoners’ affirms the human rights of people in prisons, including the “right to take part in cultural activities and education aimed at the full development of the human personality”. 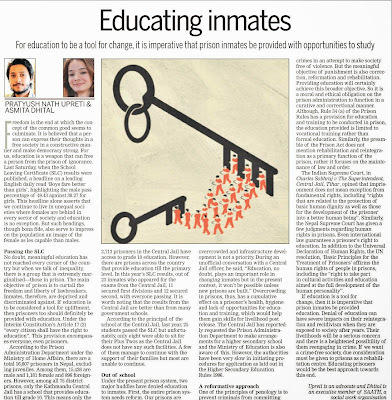 If education is a tool for change, then it is imperative that prison inmates be provided education. Denial of education can have severe impacts on their reintegration and recidivism when they are exposed to society after years. Their livelihoods will be a serious concern and there is a heightened possibility of them reengaging in crime. If we want a crime-free society, due consideration must be given to prisons as a rehabilitation centre. Educating prisoners would be the best approach towards this end.